Trae Young led the Atlanta Hawks to their first win of the NBA season, while Russell Westbrook could not inspire the Oklahoma City Thunder in his return. 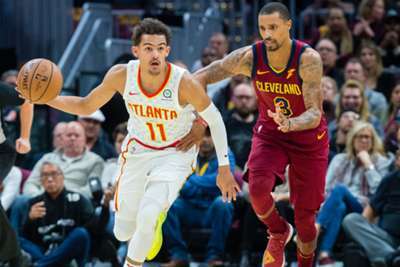 Young scored 35 points and dished out 11 assists in Atlanta's 133-111 win over the Cleveland Cavaliers at Quicken Loans Arena on Sunday. He also knocked down six of his 14 three-point attempts. "I'm glad we got this win," Young told reporters after the game. "I'm excited with the way I played and the way my team-mates helped me … I got a good rhythm early, felt good in warm-ups. When you see that ball go in a few times, you get into a rhythm." Atlanta (1-2) wing Kent Bazemore added 23 points while Kevin Love tallied 16 points and 17 rebounds for the winless Cavs (0-3). The Thunder, on the other hand, were topped by the Sacramento Kings 131-120 at home. Westbrook made his first appearance of the campaign after missing the first two games of the season as he continued to recover from a September knee procedure. The 2017 MVP tallied 32 points, grabbed 12 rebounds and tallied eight assists but it was not enough to lift the Thunder to their first win of the season. Iman Shumpert and De'Aaron Fox combined for 48 points and 14 rebounds in the Kings' win over the Thunder. Stephen Curry poured in a game-high 30 points in the Golden State Warriors' 100-98 loss to the Denver Nuggets. Cavaliers rookie guard Collin Sexton shot two-for-11 from the field and scored four points in Cleveland's defeat. Avery Bradley registered a minus-21 and recorded four points in the Los Angeles Clippers' 115-112 win over the Houston Rockets. Juan Hernangomez blocked Damian Jones from behind to secure the Nuggets' victory over the Warriors. LeBron James will look to get his first win in a Los Angeles Lakers uniform against the San Antonio Spurs at Staples Center on Monday. Los Angeles will be without guard Rajon Rondo and forward Brandon Ingram, who were both suspended for their roles in a scuffle with the Rockets on Saturday.